One of the coolest things about starting this blog is the connection I’ve made with other bloggers. Although there are quite a few family members and friends who read my posts, the overwhelming majority of followers are fellow writers and bloggers who take the time to check out my site, subscribe to my feed and offer up insightful and kind comments on the things I write. Fortunately for me, I’ve stumbled upon a supportive community of diverse and inspiring people who have most often started their own blogs just for the love of sharing and to honour the creative process. One such follower is Tricia over at The Do-Gooder Mama. Tricia is a brilliant woman who has put her career in the non-profit sector on hold to raise her 2 young daughters and as she puts it “ just because I am home raising my totally delectable and scrumptious babies and not contributing to the household coffers in the traditional sense, does not mean I have to allow myself to succumb to Mommy Brain Atrophy. And so, The Do-Gooder Mama, was conceived.” Her site is chock full of ideas that combine her passions for motherhood and charity and quite often I have been inspired to try out her “do-gooder activities” with my own family. 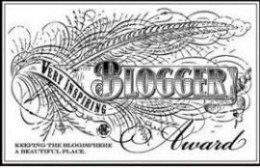 A huge thank you to Tricia for nominating me for the “Very Inspiring Blogger Award“. I am honoured. And the award is even sweeter since it came from one of my peers and someone I admire. 2. Although I’m a plant-based foodie, I really don’t enjoy traditional salads all that much. 3. My husband thinks I’m a class-a-holic because I sign up for practically every class/workshop/seminar that I hear about (and he’s right). 4. I love to go dancing and I’m not afraid to be the first one out on the dance floor. 5. A psychic once told me I was a warrior in another life. 7. I think “Sweet Georgia Browns” at Purdy’s are hands-down the best chocolates on the planet! Thanks again Tricia and thank you to all of my fellow bloggers who inspire me to keep learning, writing and creating every day!